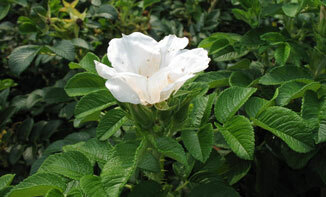 The answer is Rugosa roses. These have thick leaves that protect them from the wind and salt spray. Originally found on the coastal margins of Japan and China they are very hardy and will grow in poor soil. The single five petalled roses tend to have the best rose hips, such as Corylus and Ann Endt — those of you who are horse lovers can feed the big juicy hips to your horses to give them a vitamin boost, or you can make your own rose hip jelly or syrup to give yourself a vitamin boost during the winter months. The double (packed with petals) rugosas tend to have the best fragrance such as Blanc Double de Coubert, Hansa and Mrs Doreen Pike. Mrs Doreen Pike is the only rugosa rose that David Austin bred. It has unusual lime green foliage against which the soft pink rose with a green eye stands out. Rugosas not only generally repeat flower, have perfume, produce fantastic rosehips, but they also produce stunning autumn foliage in bright yellow, orange and red colours. They are very prickly which helps make them possum proof.